Recently the Wade Center unveiled a new display in its museum space, recounting the story of C. S. Lewis’s Till We Have Faces (1956) and how it came to be written. The exhibit features the portable Royal typewriter upon which Joy Davidman typed the novel, as well as a colorful afghan she crocheted for Lewis. 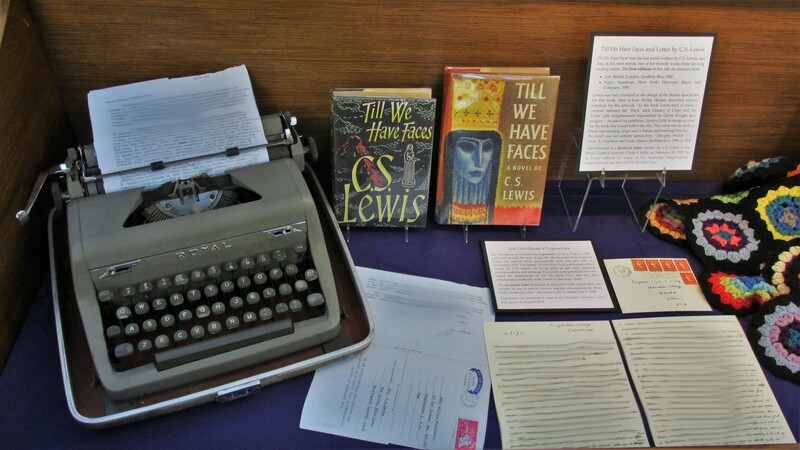 Museum display featuring Joy’s typewriter, and first editions of TILL WE HAVE FACES by C. S. Lewis (Left: British, London: Geoffrey Bles, 1956; Right: American, New York: Harcourt, Brace, and Company, 1957). In 1960 Lewis sadly noted about Till We Have Faces in a letter, “that book, which I consider far and away the best I have written, has been my one big failure both with critics and with the public.” But time can heal wounds and bring fresh perspectives, and Lewis’s late novel is now generally regarded as one of his best, if not the best. As scholar Doris Myers explained, “The cure for such disappointment [of Lewis’s early reviewers] is to realize that Lewis is doing better and much more difficult things than his readers demand of him” (Myers, 213). The point is well made. Lewis’s readers had been accustomed to enjoying a clear sense of “the good guys vs. the bad guys” in his stories, along with accessible Christian themes. But Lewis offered a number of bold innovations in this, his last novel. For one thing, the main character is not a guy at all—she is Queen Orual of Glome, a fictional kingdom between Europe and Asia in the third century before Christ (Myers, 194). The novel is subtitled A Myth Retold because it is a reworking of the story of Cupid and Psyche, first recounted by the Roman tale-spinner Apuleius. Ever since Lewis’s undergraduate days, he wanted to retell the story with a much psychologically nuanced portrayal of Psyche’s siblings. In his mid-twenties, Lewis wrote 156 lines of rhyming couplets recasting the Psyche story, a fragment now preserved in “The Lewis Papers” at the Wade Center. In this early version, the beautiful Psyche had an equally attractive brother, Jardis, and motherly older sister, Caspian. The sibling characters completely evolved in later drafts, but those names, or something very like them, did not go to waste in Lewis’s later fiction! Joy and C. S. Lewis, 1958. 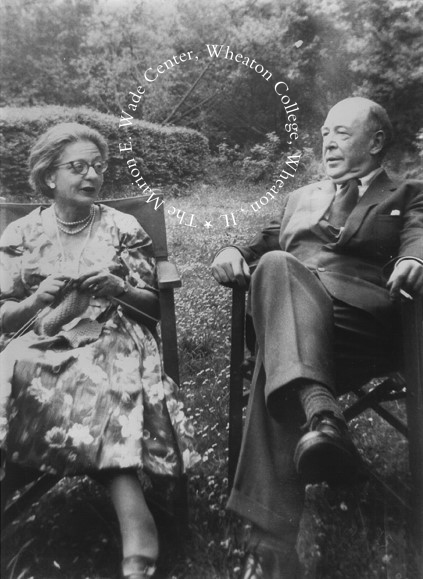 While Joy Davidman and her two sons were visiting the Kilns in March 1955, Lewis complained to her that he was in a creative dry spell. The two of them “kicked a few ideas around” that evening, and Joy was amazed to discover the next day that “Jack” had already written the first chapter! Joy felt that Lewis was a far more gifted writer than she was, but that she “helped him write more like himself,” and that he found her advice “indispensable” (Hooper, 247-248). Joy continued to discuss the unfolding story with Lewis, and she used her Royal typewriter to turn his inky handwritten pages into neat typescript. She may have been something of a creative collaborator on the project, as some of Orual’s life-experiences seem to reflect Joy’s past more than Jack’s. Joy’s son, Douglas Gresham, believes that it was his mother who gave Lewis the boldness to write an entire novel from a female point of view. Sources cited: The most helpful single resource on Till We Have Faces is probably Walter Hooper’s masterful C. S. Lewis: A Companion and Guide (1996). Two other insightful and useful studies are Peter J. Schakel’s Reason and Imagination in C. S. Lewis (1984) and Doris T. Myers’s C. S. Lewis in Context (1994). The quotation from Lewis’s letter is taken from The Collected Letters of C. S. Lewis, Vol. 3, p. 1181 (to Anne Scott, August 26, 1960).